This Book provides a solid foundation to the new idea of rewriting the history of the world on purely scientific basis and treating it as a multi-disciplinary science subject by the Universities of the world. Seminar Memento released by His Excellency Dr. A.P.J. Abdul Kalam (former President of India) at the inauguration of the seminar on 30th July, 2011. Ms. Saroj Bala belongs to 1972 batch of Indian Revenue Service (IRS). She has been deeply involved for last many years in scientific research into the historicity of ancient events narrated in Vedas and Epics. The research project ‘Scientific Dating of Ancient Events before 2000 BC’ was conceived by her and she is its Chief Research Coordinator. 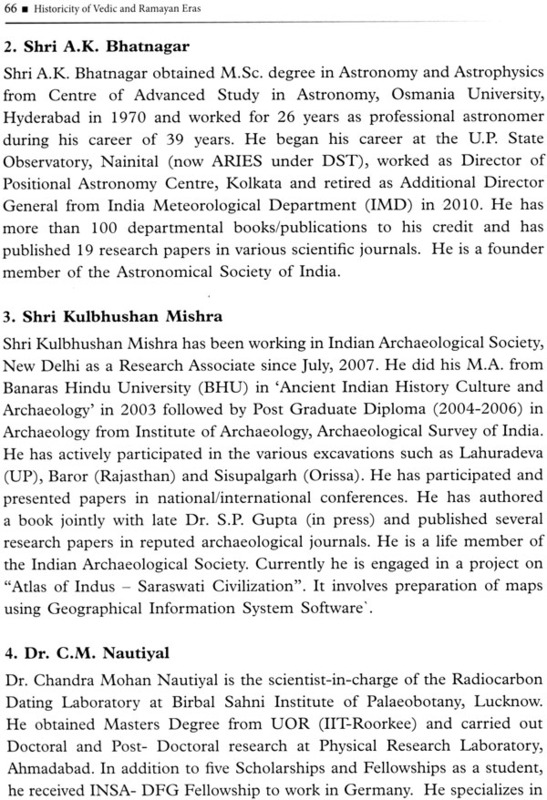 Shri Kulbhushan Mishra, a young scholar in Archaeology, is working as a Research Associate in Indian Archaeological Society. He has authored a book entitled “Practical Dictionary of Indian Art, Architecture and Archaeology” jointly with late Dr. S.P. Gupta (in press) and has published several research papers in reputed archaeological journals. Currently he is engaged in a project on “Atlas of Indus –Saraswati Civilization” which involves preparation of maps based on GIS. (vii) Geographic and Geological research tools. • To ascertain astronomical dates of planetary references in ancient Sanskrit manuscripts by making use of planetarium software. • To correlate such astronomical dates with corroborating archaeological, anthropological, paleobotanical, geological, ecological, oceanographic and remote sensing evidences. • To highlight the fact that some new scientific tools and inventions can scientifically determine the authenticity and historicity of ancient events and as such any reliance on any religious beliefs or linguistic guesswork is not necessary. Such scientific dating is not only credible and convincing but is also likely to push back the antiquity of our civilization by 4-5 millennia, giving all Indians a shared pride in our rich cultural heritage. 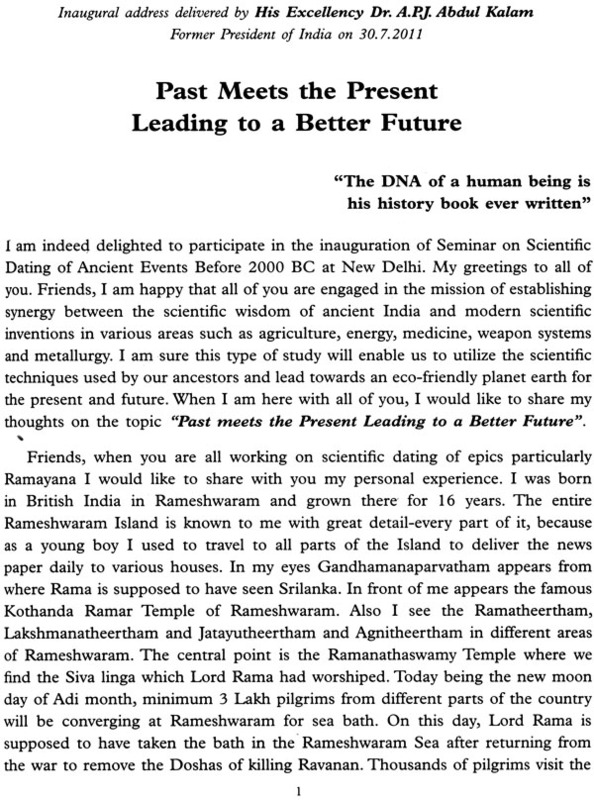 • To persuade the central and state governments to incorporate such research outcomes in books meant for schools and colleges all over India so as to enable the young minds to appreciate our true history, reconstructed purely on scientific basis. These research reports are already available with the Ministries of Science and Technology, Earth Sciences, Water Resources and Culture. 4. Dr. D.S. Kothari, a highly respected nuclear physicist once said, “How can we lament lack of national pride in Indians, without first acquainting them with country’s phenomenal scientific achievement in the dim distant past?” Scientific knowledge cannot be rooted in mythology; it can only be based on reality and can only be extracted from the books/manuscripts narrating the true events of the past. Therefore the I-Serve Research Team aimed at determining the historicity of ancient events on purely scientific basis. 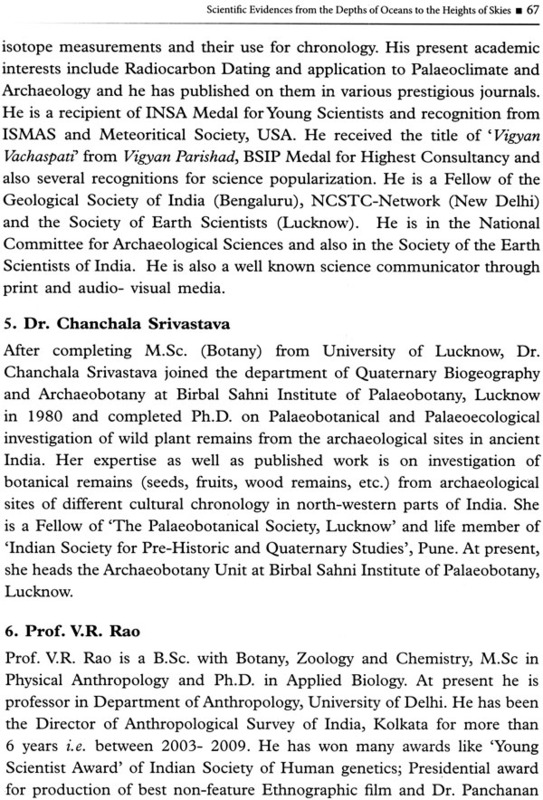 This research team, consisting of Sanskrit scholars, astronomers, archaeologists, anthropologists, geologists, oceanographers and other subject experts, after carrying out research for more than three years, decided to place research outcomes before the scientists/original researchers and the public in respect of the first part i.e. Scientific Dating of Ancient Events Before 2000 BC. A two days’ National Seminar on this subject was therefore held on 30th and 31st July, 2011 at Indian Institute of Mass Communication (IIMC) in New Delhi. (i) The astronomical dates of planetary references in ancient Sanskrit books, calculated so far by using planetarium softwares, indicate the development of an indigenous civilization in India from dates even prior to 6000 BC. Astronomical references in Rigveda represent the sky view of dates belonging to the period 8000 BC to 4000 BC and those mentioned in Valmiki Ramayan refer to sky views seen sequentially on dates around 5100 BC. Were these dates exclusive and did these match sequentially? (ii) The ecological references in ancient books, especially those relating to melting of glaciers and fluctuations in water volumes of ancient rivers seem to corroborate such astronomical dates. Remote Sensing pictures taken by ISRO, corroborated by sedimentology, hydrogeology and drilling data, have revealed that a mighty river system was flowing around 6000 BC from Himalayas to Rann of Kachchh, passing through Himachal Pradesh, Punjab, Haryana and Rajasthan, exactly matching the descriptions of Saraswati in the Vedas and Epics. What name could be given to this river system, if not Saraswati? (iii) Recent research reports on paleoclimatic changes have revealed that, after the last ice age in the beginning of the Holocene, the glaciers naturally first melted near the equator i.e. in Sri Lanka and south India, and civilization started developing on the banks of the rivers which started flowing there. When populations multiplied, these river waters became insufficient and some more adventurous people started travelling from south to north. Such northward migration continued for several centuries and finally when these people reached the banks of Himalayan Rivers, they got climatic conditions conducive to long term development of civilization on the banks of these rivers providing security of water, food and shelter. Thousands of years later, when some of these Himalayan rivers became non-perennial or started drying up, some of these people moved towards Central Asia, West Asia and Europe. As per ecologists, this ecological cycle has been repeating itself and will get repeated after every ice age. So did any Aryans really come from Central Asia to civilize the people of India or the dispersal probably happened the other way round? (iv) The oceanographic reports on fluctuations of water levels in the oceans have revealed the existence of many coastal archaeological sites, either submerged or now found land locked, dated from 7500 BC onwards e.g. a Neolithic site near Hazira, Dholavira, Juni Kuran, Surkotda, Prabhas Patan and Dwarka in Gujarat. Do these reports corroborate the astronomical dating of those ancient events with which these places are connected in our epics? (v) The paleobotanic research reports have reported that certain cultivated varieties of plants, trees and herbs, which are mentioned in Vedas and Epics, have existed in India continuously for more than 8000-10,000 years. Since these remained in use continuously, was there any abrupt end of ancient Indian civilization as is normally believed? (vi) The anthropological research reports have established that DNA dating for Paleolithic continuity starts from 60,000 BC. The Genome studies during the Holocene have revealed that the genetic profile of humans settled in north, south, east and west of India is the same and has remained the same for the last more than 11000 years and that it does not match the genetic profile of people from Central Asia or Europe. Therefore, contrary to the popular belief, do the Dravidians, tribals, as well as the north Indians have common ancestors? (vii) The latest archaeological excavations have revealed a large volume of data which has proved the indigenous origin and development of civilization in the Indian Subcontinent since 7000 BC. Some examples are: Mehrgarh, Kot Diji and Nausharo in the Northwest; Lothal and Dholavira in the west; Lahuradeva, Jhusi, Tokwa and Hetapatti in the east. Is archaeology also supporting the astronomical, ecological and anthropological conclusions that Aryans were original inhabitants of India, who have been developing an indigenous civilization in India for last more than 10,000 years? 6. His Excellency Dr. A.P.J. Abdul Kalam was an important source of inspiration for the research team and his presence to inaugurate the first seminar on the subject boosted the morale and reinforced the commitment of the research team to reconstructing the ancient history of the Indian subcontinent on purely scientific basis so that it could become a source of shared pride for all Indians in their rich and most ancient cultural heritage. 7. This methodology of multi disciplinary scientific research was applied in some greater detail by the Director of I-Serve Delhi Chapter for dating the era of Lord Ram. The results were outstanding, rather amazing! 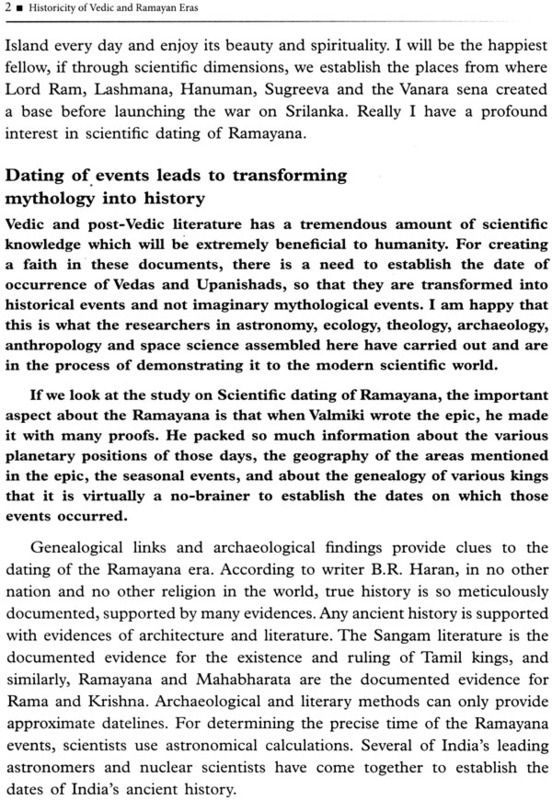 A summary of the conclusions arrived at reflecting credible and convincing correlation of archaeological, genealogical, anthropological, paleobotanical, geological, ecological, oceanographic and remote sensing evidences with the astronomical dating of important events in Lord Ram’s life is included in the form of an article in this compilation. 8. The World has come a long way after the old Christian belief that the earth was created on 23rd October, 4004 BC and therefore events relating to the period earlier than that had to be treated as mythology. The beginnings of the Holocene are now placed around 12000 BC by pushing these back by about three thousand years. Therefore the history of the development of civilization of the world post last ice age has to start at least 11,000 years ago. Consequently not only the history of India but also the history of the whole world has to be reconstructed based on such multidisciplinary scientific evidences. As a result not only Ramayan and Mahabharat but also epics like Iliad and Odyssey are likely to shift from the realm of mythology to the realm of history. This research project and the first seminar on the subject mark the beginning of this new idea. 9. In future, the Universities of the world may not place History as a subject under Faculty of Social Sciences or of Arts, but this subject deserves to be placed under the Faculty of Sciences. Yes, it should be designated as a multi disciplinary science subject! The history should be scientifically reconstructed as well as taught by the scientists from different disciplines of science and doctorates on the subject should be awarded not to individuals but to multi disciplinary research groups working under teams of scientists as guides. A small beginning being made in that direction in the form of this book is placed at the feet of God Almighty with the prayer that let the people of the world be inspired to rewrite the history of the world, particularly of the Indian subcontinent, by correlating the research reports from different disciplines of science with the astronomical dating of events narrated in ancient books. Let us objectively and scientifically determine if Vedas, Upanishads, Epics, Buddhist and Jain literature etc. contain any references to true historic events and therefore contain any worthwhile scientific knowledge, the rediscovery of which may help in improving the quality of our lives because human beings are the products of the past and live immersed in it and the future of mankind depends on true appreciation of its past!